Mazda’s most popular model is, arguably, the most impressive non-luxury crossover on the market. The 2018 Mazda CX-5 enjoys a composed and sporty design, stacked feature set and focus on driver and passenger comfort over simply trying to one-up competitors with incrementally-better specs. Still, it manages to outdo the competition. One of Mazda’s secrets to the brand’s success as an up-and-coming entry-luxury badge with high-value pricing is that it doesn’t split its production between an economy brand and a luxury brand like competitors Toyota, Honda, Nissan, Ford and Hyundai all do. This has allowed Mazda to boldly inject luxurious style and craftsmanship into their sedans and SUVs, undaunted by the possibility of cannibalizing sales from a more expensive and elegantly-styled luxury platform-mate. In this comparison, the 2018 Mazda CX-5 compact crossover challenges the Toyota RAV4. The design seems to be an immediately-apparent advantage for the Mazda CX-5, but we’ll compare them as complete vehicles. Shop our Mazda CX-5 inventory now! The Mazda CX-5 enjoys several strong improvements over the similarly-sized Toyota RAV4. 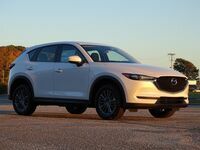 Both SUVs were awarded Top Safety Pick from the Insurance Institute for Highway Safety, but that is where their similarities end and the dominance of the Mazda CX-5 begins. In a class chosen for its all-weather handling, interior space, ground clearance and safety, the 2018 Mazda CX-5 bests the RAV4 in every meaningful metric. Paradoxically, offering more horsepower and better fuel efficiency, the 2018 Mazda CX-5 proves to have the better engine. The 2.5L SKYACTIV®-G powering the Mazda CX-5 is efficiency and powerful, allowing you to pass confidently and tow up to 2,000 lbs. when properly equipped. Both vehicles offer all-wheel drive, but you’ll undoubtedly find the extra ground clearance on the Mazda CX-5 (almost 1 ½ inches of it) to provide a superior driving experience on snow, or during light off-roading adventures. With luxury style making up both the interior and exterior of the 2018 Mazda CX-5, Mazda has gone above and beyond in nearly every driver and passenger comfort and convenience-centered category. Among these, include the base infotainment system – 6.1” on the Toyota RAV4 and 7.0” on the 2018 Mazda CX-5. The CX-5 also gives you the Command Controller, a small panel of controls in the center console that allow you to switch media/adjust navigation and make other changes without touching the full-color screen. Finally, all of these improvements and the evocative design are not upgrades you’ll pay for over the woefully-bland RAV4. The 2018 Mazda CX-5 Sport comes in hundreds of dollars lower than Toyota’s base RAV4 LE and thousands of dollars lower in its highest trim Grand Touring than the RAV4’s similarly-featured Platinum. At Medlin Mazda, we’re proud to be able to offer the style and features with which Mazda imbues all of their cars and SUVs. Although the Toyota RAV4 is a fine SUV, the 2018 Mazda CX-5 is simply better in every way. For more information on the 2018 Mazda CX-5 or to schedule a test-drive, contact our Mazda dealership in Wilson today! Click here for more info on the 2018 Mazda CX-5!